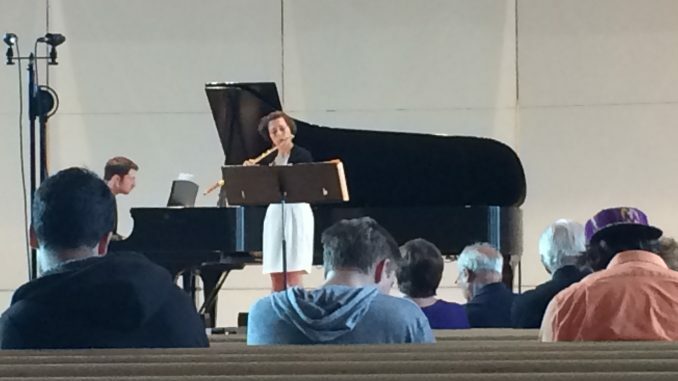 Last Sunday, Tess Miller performed a faculty recital on flute and piccolo entitled “Word Play: Music Inspired by Words, Words Inspired by Music.” The program featured music selections that were inspired by quotes, poems and stories. Besides being a flautist, Miller is an instructor at Albion College, Alma College, Olivet College, and Michigan State University Community Music School. She has a doctorate in musical arts from Michigan State University and is a Certified Music Practitioner. She reviews CDs and new music for the publication Flutist Quarterly. She is part of multiple chamber ensembles, including Everon Duo, Extreme Duality, and The Great Lakes Art Music Ensemble, which produced a CD in 2010. Variations for flute and piano on “Trockne Blumen” by Franz Schubert was one of the pieces she played during the recital. The piece features seven different musical variations of the poem “Trockne Blumen” as well as an Introduction and Thema. Each variation had different emotion styles featured around one main melody. At first it began with the proper style of music you would expect of a ballroom or palace court in 1824 (when the piece was written). One of the movements is really joyful and happy and contains many trills. Another movement contains lots of piano phrases mixed with flute phrases that make the music seem peaceful and relaxed. In contrast, a different variation has many accented notes that make the piece seem somewhat angry. Miller also performed “Philadelphia Portraits: A Spiritual Journey” by Cynthia Folio, which has four movements focusing on famous Philadelphian musicians Vincent Persichetti, John Coltrane, and Marian Anderson. Each of the first three movements contains quotes from various works of music by the musician the movement is based on. The final movement is supposed to represent Benjamin Franklin through mimicking the sound of the glass harmonica, one of his inventions. Quotes from each person help to mold the emotion each movement is supposed to evoke. “Danses Des Moucherons”, translating to “Dance of the Midges,” by Sidney Lanier is meant to represent the way midges – a small, soundless bug – fly. The piece contains many quick notes. Some are slurred together, creating the feel of a bug gliding through the air, while at other points the notes are very staccato, creating the image of the tiny bugs. Miller also performed “Goldfish Through Summer Rain” by Anne Boyd, which had the title purposely left out of the program so that the audience could try to guess what words would be used to title it. “‘Goldfish Through Summer Rain’ is one of those rare pieces where title and content are equally evocative. I wanted to give the audience a chance to listen to the music without the aid of words for at least one piece in order to give them an opportunity to let their imaginations wander. I wanted them to think about how words can influence their reception of a piece and how listening before having words can really spark their own inner creativity as listeners,” said Miller. The recital’s final song was “Legends of Mackinac” by Scott R. Harding. It features guests Scott Harding, the piece’s composer, on percussion and Melissa Angel Strauss on double bass. The song has three movements that focus on three different Chippewa myths about three areas on Mackinac Island. During the performance, Harding narrates some of the stories over the music. With the added drum beat and the flute’s style change to sound more like a pan flute, the song incorporated a Native American vibe. This made the narration over parts of the piece seem as if it was the Chippewas telling the myths around a bonfire with music in the background to add to the mood of the story. The final movement of “Legends of Mackinac” was called “Skull Cave: Bed of Bones,” which conveyed the myth that a fur trapper spent an uncomfortable night in a cave only to wake up and find he was sleeping on human bones. The music sounded more ominous as the story got to the point where he discovered he slept on bones. Katie is a senior from St. Clair, Michigan. She is a double major in English and communications who loves reading for fun, performing music, and dogs. She is part of the Honors Program and the Editor-In-Chief of The Albion Review. She looks forward to working in the book publishing field after graduation.